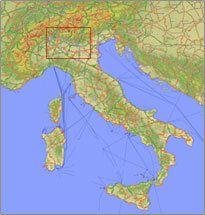 The quickest way by car is from the A4 Milan-Venice motorway. - Ospitaletto exit, straight on at the first roundabout and follow the signs to Val Trompia. - After about 9 km, turn left at the traffic lights at Concesio onto the SP345, following the signs to Lumezzane and Gardone V.T. - After about 4 km, turn right towards Lumezzane. - Our offices and factory are on the main road on the left - Via Antonini 123.